If you live in a house where strange things happen, it would be nice to have some ground rules so all the persons residing–living, dead, demonic or otherwise–can get along peaceably and happily. Otherwise, you’re bound to be possessed, abducted, maimed or killed in some gruesome fashion, I’m sure. Just look at what happened to the family in “Poltergeist.” You don’t want their plight to be yours, do you? “Paranormal Activity 4” has been kind enough to send along some basic house rules so you and your “special” houseguests can live together…sort of. Check out the list below and see if you can enact them in your household. Your family and the strange forces in your house might be much better for it. “Paranormal Activity 4” comes to DVD and Blu-ray today. The film is directed by Ariel Schulman and Henry Joost and stars Kathryn Newton, Katie Featherston and Matt Shively. The film continues the “Paranormal Activity” saga five years after the strange disappearance of Katie and Hunter. This time, some neighbors realize something strange is going on with their new neighbor and her son. 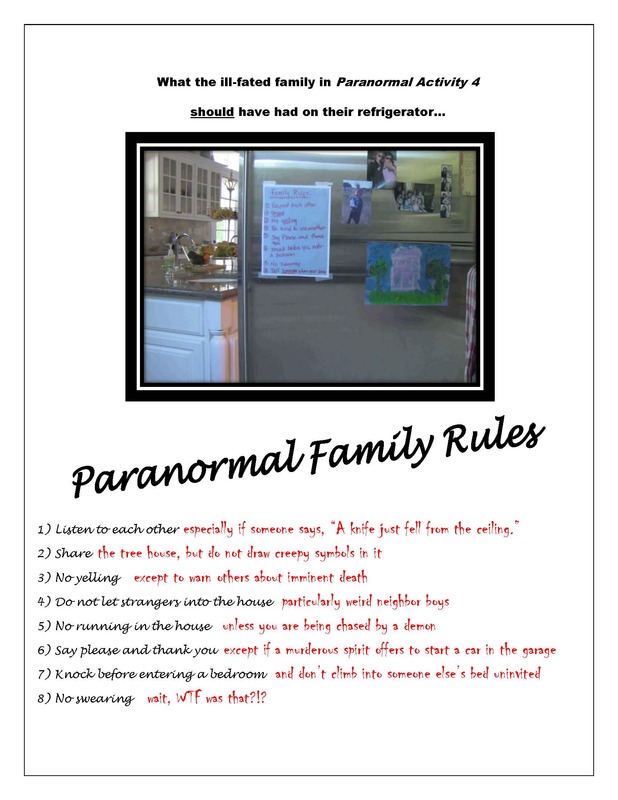 What do you think about “Paranormal Activity 4” and the haunted house rules? Give your opinions in the comments section below.